After graduating from college in 1994 Rich made the move to Tahoe City California, in the heart of the Sierra Nevada Mountains. It was there that he began to immerse himself in backcountry adventure. Skiing, hiking, biking or climbing was the daily focus. As things progressed Rich was drawn into guiding and began to immerse himself with courses and organizations like the AMGA, NOLS, WMI, AIARE, PSIA, and others. One of Rich’s first guiding opportunities was leading a 39 day trip to Alaska for a dozen 16 year old kids, that included sea kayaking, backpacking, ice climbing, and rafting. He was hooked. Guiding has taken Rich to places like: Mt. Shasta, Mt. Rainier, Denali, Ecuador, Chile, Argentina, Antarctica, Canada, Alaska, France, Switzerland, and throughout the western United States. Guiding on skis or on foot, Rich strives to make every day educational. Teaching is a large component of every trip. 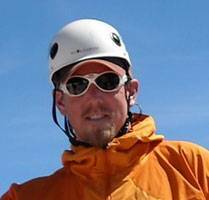 Rich teaches avalanche courses, glacier seminars, backcountry ski skills, climbing courses, and trains aspiring new guides. From the Haute Route in Europe to the Andes of South America, Rich has made an effort to enhance his clients experience with effective communication. Giving folks the information and skills not only to follow, but to become confident backcountry skiers and climbers. After extensive travel and training over the years, Rich has been able to educate hundreds of guests as to the importance of taking care of our natural world. Along with safety (and fun), traveling with respect for the mountains is always a priority. Join Rich on an incredible mountain adventure! Rich has been involved with the Breast Cancer Fund since 2003. The BCF is the only national non-profit organization whose sole focus is to identify – and advocate for elimination of – environmental and other preventable causes of the disease. It has been a privilege to work as a guide on their annual fundraiser “Climb Against the Odds” on Mt. Shasta. Donating time and money to their cause is a small way Rich tries to assist the BCF in their mission. Rich and Clif Bar have partnered up since 2007 to offer free avalanche awareness workshops for Bay Area skiers & climbers. This annual presentation also functions as a fundraiser for the Mt. Shasta Avalanche Center. Over the years we have raised hundreds of dollars for the Avalanche Center, and hopefully raised the awareness of many backcountry skiers out there.